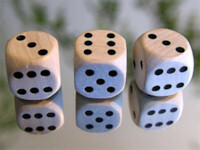 Crag is a dice game played with three dice, and plays somewhat similarly to the commercial game of Yahtzee. Crag uses three dice (rather than five). You only get two rolls per turn (rather than three). The player with the highest score after filling all 13 categories is the winner! The web site dice-play has a nice description of the rules, as well as an excellent score sheet you can print out.